Use the Installation guide. Make sure that Secure Boot is disable in BIOS Setup. Install this BIOS update (or a newer one) to fix a serious bug concerning hyperthreading and issues with thunderbolt   , which can affect you even if you don't use thunderbolt. See Flashing BIOS from Linux for details on how to install the BIOS without an optical drive; the geteltoritoAUR method is known to work on the T570. 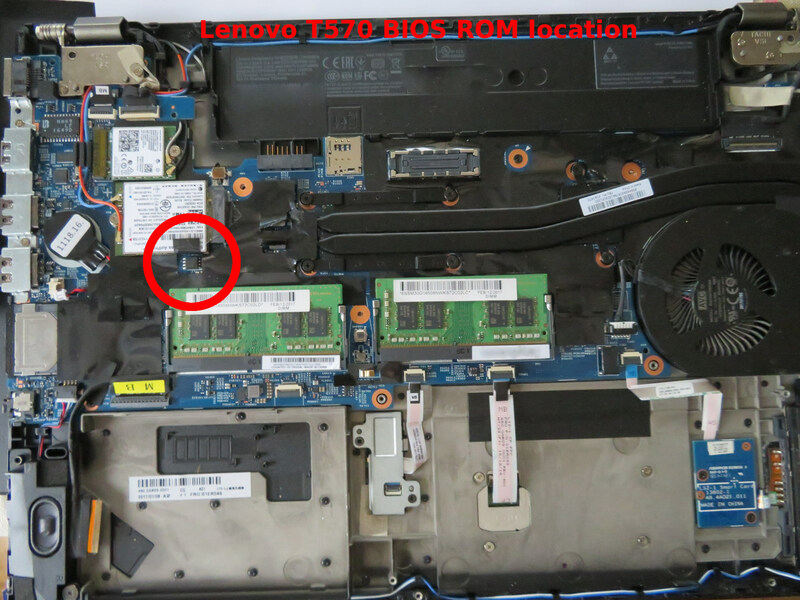 Note: before flashing, you have to disable the Intel BIOS guard or risk bricking your laptop. In the BIOS, set Security - Intel (R) SGX - Intel (R) SGX Control to Disabled. Do the same for Device guard, if needed. If you corrupt your BIOS, you can fix it by flashing a working ROM directly into the EEPROM chip either with a Raspberry Pi or a specialized programming device. If you got bitten by the Intel BIOS (Boot) Guard, you can follow these instructions to reverse the damage. Locate the chip containing the BIOS. It is under a black sticker (see photo). The model of the chip is MXIC MX25L12873F M2I-10G (see datasheet). Connect your programming device to the chip using a SOIC8 clip. You should probably support the clip and its cable somehow, so it remains completely still. When you hit the corresponding ID, you will see something like this in the Message section of UEFITool: "Unicode text "N1VET31W" found in PE32 image section at offset 31B0h"
In your old corrupted BIOS, the section with the corruption is pinpointed by UEFITool with a message like "parseSection: GUID defined section can not be processed". Double-clicking the message will show you the volume it belongs to. In the BIOS region, you will replace the corrupted volume and all the preceding ones with healthy volumes extracted from the downloaded BIOS image. This type of minimal replacement is needed instead of replacing every volume, because UEFITool is not yet smart enough to preserve all the required Boot Guard data. UEFITool_NE (New Engine) is able to display the Boot Guard keys and signatures, but, as of the writing of this, is not yet able to do volume replacing. It is probably a good idea to use the NE version to do the extraction. If you find your bootloader is gone, install it using a live USB. Until bbswitch is updated to support the new power management method, add pcie_port_pm=off to your kernel parameters. If you have a very weak bluetooth signal when using wifi, make sure you have a recent linux-firmware. See https://bugs.launchpad.net/ubuntu/+source/linux/+bug/1721271 for more information. This page was last edited on 9 March 2019, at 16:24.